Horndale has been around for a while – since 1896 in one form or another. The distillery is no longer there and the vineyards have been reduced from over 300 acres reduced to just 1.5 acres (of Red Frontignac grapes used to produce a fortified wine). The current owners bought the Happy Valley facility in 1984 (see map for the location) and the website is at www.horndalewinery.com.au. The cellar door is different as it is in the sprawling suburbs of southern Adelaide and has an extensive wine list of all styles. 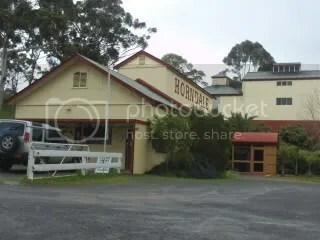 Horndale is known for value for money wines and a vast array of fortifides as the location is shown via this link. This is more than just a sweet red with bubbles. There is a hint of aged complexity – probably from some smart blending of base wines. Share this one with friends while eating BBQ’d sausages or ribs. This wine is similar to the one above with some extra aged characters. I suspect that the wine base for this wine is the same as above but aged in or with oak for a longer period. Drink this wine with roast turkey with cranberry sauce (a classic match for a sparkling red). A late picked burgundy style showing the European heritage of Horndale’s owner and is made from late picked (17 Be) shiraz grapes from Mclaren Vale. The wine is surprisingly good from one who does not normally drink sweet reds. You could drink this on a warm afternoon either while reading a book or with a group of friends. A lighter style fortified that is excellent for use in your own port barrel blending. 20 years ago I used Horndale port to start my 5L port barrel and this blend has never looked back. This excellent aged fortified is made from the hand picked grapes from the remaining vineyard surrounding the cellar door – a bargain at this price. It is cold & raining here in Mclaren Vale and this wine is one to have with your loved one in front of the open fire. Tawny port infused with chocolate – one for the chocolate lovers! Nice light styles and again good value for money – thay have a good local following (usually an indicator of good value for money wines). 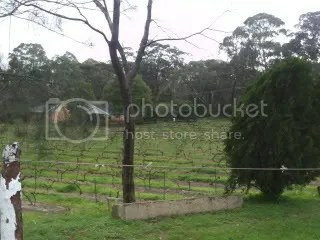 The cellar door may have a number of cleanskin or cellar door only (trial) wines. These are normally a surprise for the cellar door visitor. Thew current owners have decommissioned the Spirit Store and opened a Bistro (No.1 Spirit Store Restaurant) that is opened on Friday evenings only – it is busy enough with locals that it is advisable to make a booking if you intend to eat there. Note that purchases from the cellar door also provides you with a discount voucher for the Bistro. The No. 1 Spirit Store is available for functions (eg weddings) seating up 50+ people comfortably. The surrounds of the vineyard and the old distillery buildings make this a good facility for your next function – check it out. Horndale has had a reputation for providing quality oak barrels 2L up to 20L in volume. Prices are available from the winery. remember that the price includes the barrel filled with the Tawny Port reviewed above. One of my friends has a Horndale port barrel and it has performed well for a number of years. I would recommend one of these for a position on any bar. Horndale can organise special labled bottlings of their port or muscat wines for any occassion – such as weddings or club fundraisers. The lables are directly printed onto the bottles which is another unusual feature. They can bottle in 375 mL or 750 mL bottles. Contact the winery for a quote.